What is 'the bush'? In New Zealand, it is the native forest, which once covered most of the land. Dense and dark, it was alive with birds, insects and lizards, but sometimes impenetrable to humans. Much was burnt and cleared. Today, we value the surviving stands for their beauty, and as a habitat for unique species. Read about the adventures and encounters of some who have spent time in the bush. The bush means different things in different countries. For instance in Australia, it is the outback, which is usually quite open, with scattered gum trees. In New Zealand, the bush means the native forests. Tall trees tower above shrubs and younger trees. Beneath these grow ferns and mosses. Sunlight filters through the lush foliage, and birds and insects thrive. The bush is often dense and tangled, and you can easily get lost. The ancestors of Māori were coastal dwellers from the Pacific Islands. 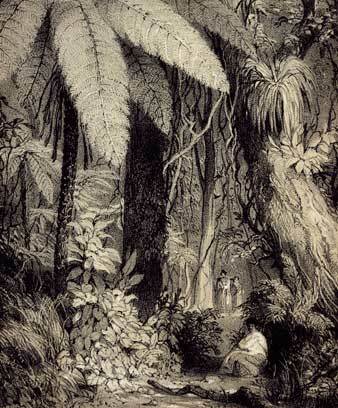 Māori tribes never lived within the forest, but they used the plants for food, medicines and other uses, and hunted the birds. They believed the bush was the home of gods and spirits. European settlers found the bush very hard to travel through. For some it was gloomy and frightening. Vast areas of the bush were cleared to create open farmland. Later, people appreciated the beauty of the remaining native forests and their unique species. A network of tracks has made it easier to walk there, and thousands of tourists visit every year. You can experience many things in the bush – from getting lost to chasing a possum!